I was surprised to get such excellent accommodations. Everything was fine, could use more selection for breakfast. The hotel was clean and comfortable. The first night I stayed was a Thursday and it was quiet, but Friday night it was busy with lots of families. There were kids running up and down the halls and it was quite noisy. It was close to the expressway. It was noisy on one of the nights I stayed. Had a very good stay at this hotel. The breakfast was awesome, the room was very quite and peaceful. Laundry didn't work, but if you stayed there for a week or so you would want to do laundry. The 118-room Holiday Inn Express Indianapolis South provides quality affordable accommodation for both the business and pleasure traveler. Items included with the room rate at this four-story hotel are a hot breakfast buffet, wireless high-speed Internet access in the rooms and lobby, local telephone calls, a morning newspaper, in-room coffee and parking. There is one room available for business or social functions that can accommodate 45 guests. Area landmarks and attractions in the Indiana Convention Center, the University of Indianapolis, Indianapolis Motor Speedway, Indianapolis Zoo, the Children's Museum, the Indianapolis Museum of Art, Indiana State Fairgrounds, White River State Park and shopping at the Circle Center Mall. All the guestrooms have a work desk with high-speed Internet access, television with cable news and movie channels, pay-per-view movies, coffee and tea making facilities, refrigerator, microwave oven, telephone with voicemail, iron and ironing board and a hairdryer. Connecting rooms, rollaway beds and cots are available. This hotel has an indoor heated swimming, whirlpool and a fitness center. The 24-hour front desk has safe deposit boxes and information on area events and attractions. Other amenities include copy and fax machines available for guest use, a coin-operated laundry, same-day dry cleaning service and ice and vending machines. The complimentary breakfast is the only meal served here. Restaurants nearby include a Red Lobster, Outback Steakhouse, TGI Fridays, an Applebees and a Bon Evans. The majority of guests who have stayed at this Holiday Inn Express rate the hotel highly. There were good comments about the well equipped rooms which were comfortable and clean, a very helpful and efficient team of employees and an excellent complimentary breakfast buffet. 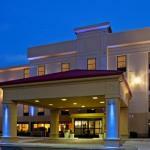 The location was good, close to the airport and five miles from the Indiana Convention Center. Many vacationers said the indoor pool and whirlpool were great places to relax after a hard day of shopping or sightseeing and they planned to recommend this hotel to family and friends.